IRS Form 8582 refers to the Passive Activity Loss Limitation Schedule that is used by real estate investors and other taxpayers who make over $100,000 per year in adjusted gross income. Form 8582 prevents taxpayers from claiming losses due to rental properties and other such investments when the income level has been exceeded. Complete Tax states that real estate professionals may be eligible for certain considerations to this law, and should contact the IRS, or Internal Revenue Service for additional details. Read all documentation included in your tax booklet to determine if you qualify for any exceptions through passive activity exemptions. The IRS defines passive activity as non-corporate activities that have been participated in indirectly by the taxpayer, such as rental of personal property for the tax year or business trade done through a third party. Gather Worksheets 1 to 3 to determine your losses through rental activity and commercial deductions. This will help you determine your gain to loss ratio. This is to determine if your losses through passive activity exceed your initial income. 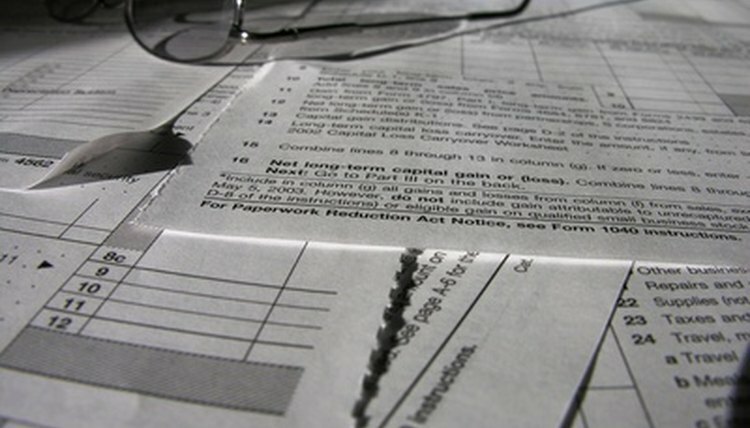 Write your figures into Part 1 on your 8582 tax form. Write down your total net loss from real estate rental where you had an active participation in Part 2 of your tax form. This section determines your allowed losses per tax year. When you reach lines 5 and 9 of this section, insert the lower figure between the two lines into line 10. This is your allowed loss for the year. Locate Part 3 and subtract the corresponding monetary amount from your tax booklet, subtracting your figure from line 10. The IRS states that all amounts you enter should be entered as positive amounts, not negatives. This section determines your allowed deductions from commercial revitalization. Fill out the corresponding worksheets for Part 4 to determine your total allowed losses from all sections. These worksheets take your figures thus far to determine if your losses exceeded your actual income. If your worksheets show a zero balance or a net income in line 4, then all losses are valid and allowed. Insert your figures in the corresponding lines on your tax form. Report the value of any publicly traded partnerships separately on form 4797, a supplement to form 8582. Do not add publicly traded partnerships to your form 8582. Use worksheet 5 to list all partnerships individually. Gains or losses from these activities will be listed on your 8582 as a PAL addition on the appropriate line. Griffin, Sharin. "IRS Form 8582 Instructions." , https://legalbeagle.com/7854973-irs-form-8582-instructions.html. Accessed 26 April 2019.